If you find something interesting during a seabed search then it is important to record some basic information about what you have found. The information can be shown to other people so they can see what has been found, it can be used to help identify the object and it forms part of a record of any objects in that area. It is also a record of the object on the day you first saw it so changes may be noticeable if the object is recorded again some time later. Your record may also become the only record of the object if it gets reburied in the seabed or removed by souvenir collectors. Basic information to be recorded includes the location of the object, its size and shape, the materials it is made of, its condition and the environment it was found in. We can also take photographs or video of the object and make a sketch of the whole thing and any important details. 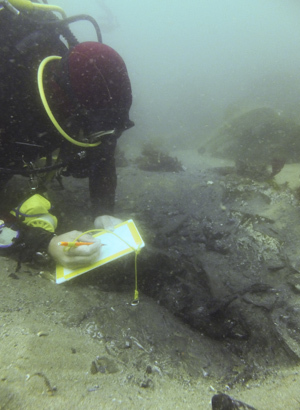 It can be difficult to identify a weed-covered, corroded and damaged object lying on the seabed so the record you make should get enough information to be able to describe the object to someone who has not seen it. The location of the object needs to be recorded so you can find it again later on. 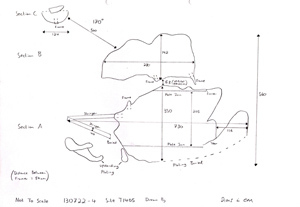 If the object was found during a search operation then the position can be marked with a delayed surface marker buoy and a GPS position of it recorded by the dive boat on the surface. The depth of water measured at the seabed should be recorded along with the time it was measured so the depth can be corrected for the height of the tide at that time. Tie a length of yellow flagging tape to the object once it has been recorded as this makes it easier to find later on. The tape also marks the object as already having been seen and recorded in case it is relocated on a later search. The overall dimensions of the object as a length, width and height should be recorded first followed by the dimensions of any details. Make a note of the units that were used for the measurements; metres, millimetres or centimetres. In some cases it is easier to make a sketch of the object and add the dimensions to that to show which measurement is which. Writing a description of the object when you are underwater is helpful in two ways, firstly it provides a description that you can show to someone else and secondly it means that you don’t forget any important points after the dive. Understanding what the object is made from can help identify what it is. Sometimes this can be a difficult task as the object may be covered in weed so removing it by hand can often make important details visible. 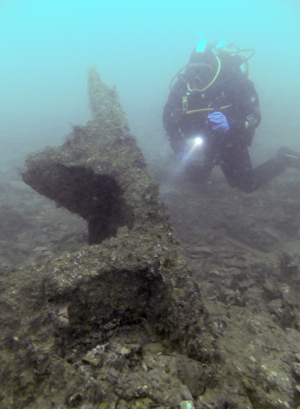 Iron objects will rust underwater and will be covered in a thick, dark layer of concretion that may also include sand, small stones and shells. A record of the type of seabed that the object was found on may tell us something about how long the object has been there and what other kinds of objects may survive. Metal objects may survive on a rocky seabed but objects made from other materials may survive if buried in soft sand or mud. The condition of the object may give a clue about its age or where it came from. If the object is obviously broken then have a look round to see if any more of it can be found. 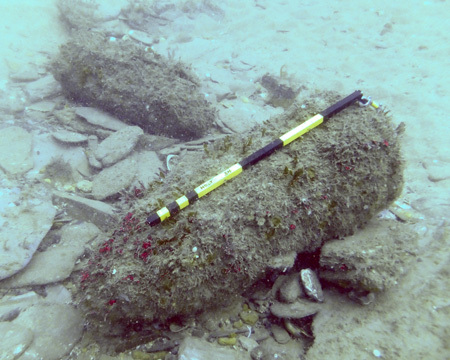 The condition may also tell us something about how long a previously buried object has been visible above the seabed. 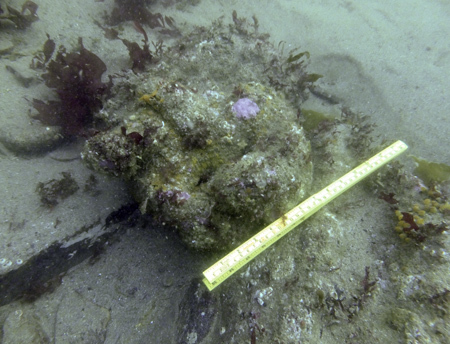 Is the object covered in weed or other marine life? Is the object firmly concreted to the seabed? A photograph of a newly found object can really help when getting other people to help identify it for you. The photographs you can take depend on the object itself and the underwater conditions but in essence you need two types of photographs, some that show the whole object and some that record particular details. A scale must be included in all photographs to give an idea of the size of the object. This should be a proper photographic scale but a plastic folding rule can be used or even a piece of your diving equipment or your buddy’s hand if nothing else is available. A typical set of photographs includes one of each side of the object, one from above and ones from the corners looking down. If the object is too large to fit into one photograph then it can be recorded in a series of overlapping photos that can be joined together later on. The camera should be close to the object and if possible the object should fill nearly the whole picture, this reduces the amount of water between the camera and the object and makes the details as sharp as possible. Photographs should be taken of any details noted on the object. Take a number of photographs from slightly different angles as some will show up the detail better than the others. In good visibility or with smaller objects, a set of photographs may be all you need but sometimes a sketch of the object is needed as well. You may not be able to see the whole object at one time so a sketch can help you understand what the object is or how it was made. A plan view of the object from above is often the most useful as many of the things we find lie flat on the seabed. For taller objects the side and end views can also be sketched so we can get an idea of what the whole object looks like. Isometric or 3D sketches of the object are also very useful but they can be harder to do. 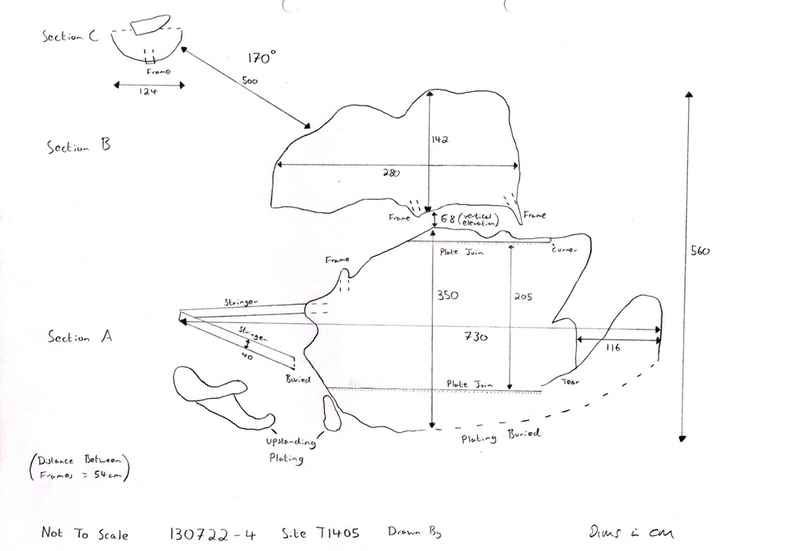 As time underwater is usually limited the sketch should start with the outline of the object as this is the most useful information and the details should be added once the outline is complete.